Summary: Rain and storms possible this afternoon and overnight. A three day span of nice weather returns before the next batch of rain for the holiday. 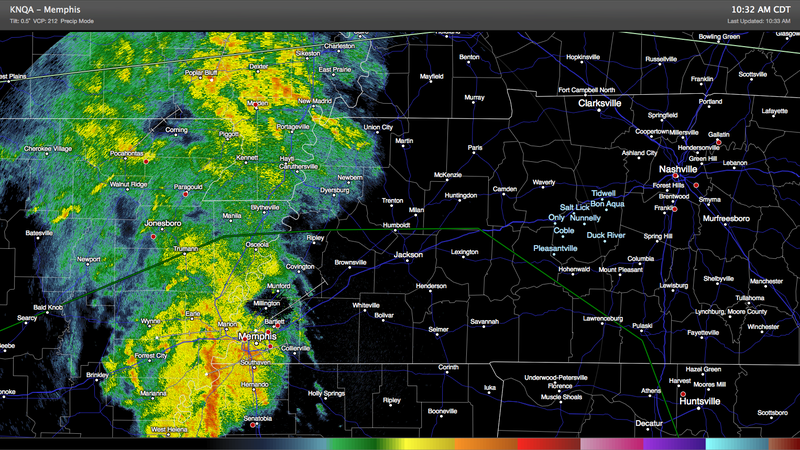 Currently, we are watching a large blob of rain and storms off to our west as they work our way this way. Today, we can expect a 60% chance of rain after 1pm today with a high temperature reaching about 81 degrees. Storms will be moving in and giving us some free grass watering. We are not outlooked for severe weather, but this doesn’t mean that one or two storms couldn’t be strong to severe. While it looks pretty impressive on radar right now, HRRR is saying it is likely to weaken some by the time it reaches here. 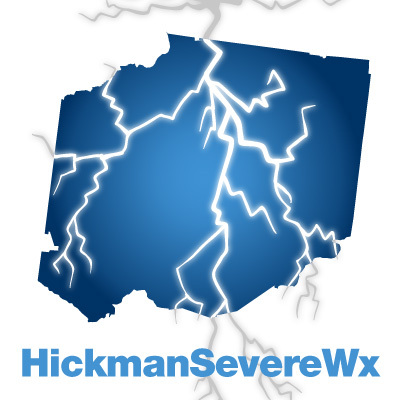 Here is the animated loop from HRRR from 10am through midnight tonight. 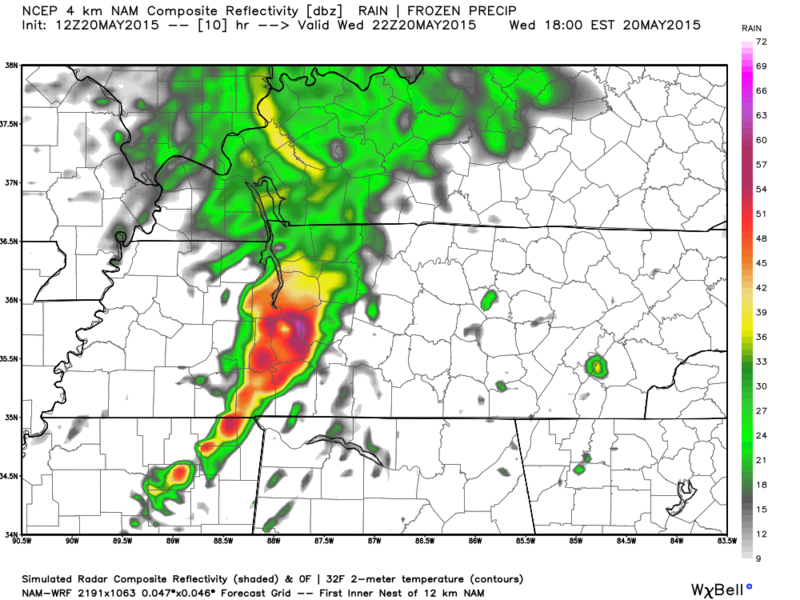 While the HRRR says the rain will weaken, NAM4 is saying they will likely strengthen. 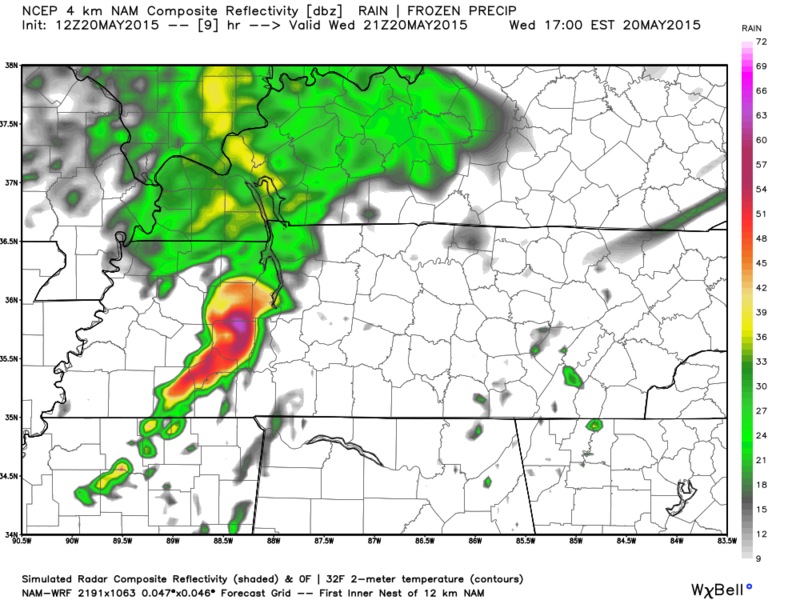 Here’s the NAM4 simulated radar for 3pm today. 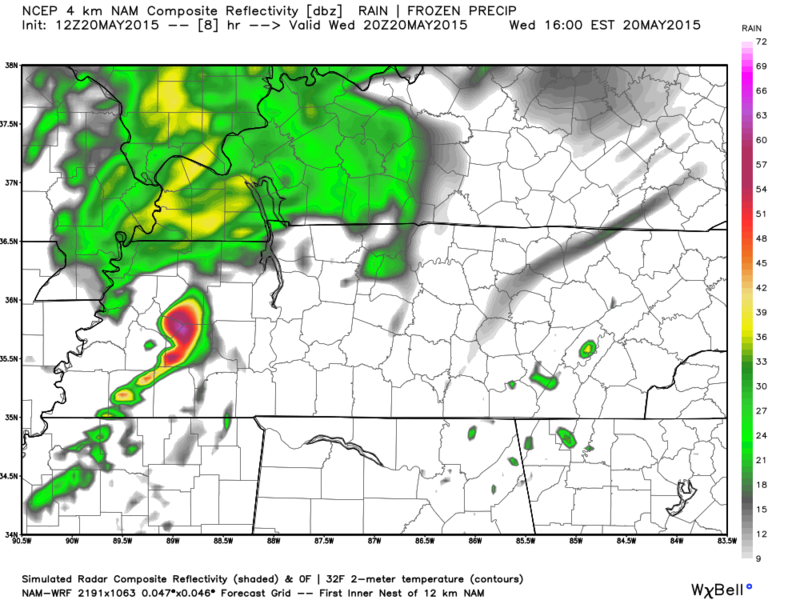 And NAM4’s simulated radar for 5pm. The HRRR model is used more for things happening the same day, as it is updated every hour. As to which will be the right model? We will find out later today. Overnight tonight we keep the 60% chance of rain as our low temperature drops to 54 degrees. Thursday through Saturday looks nice and pleasant. Thursday will be pleasant as clouds start to move out and leaving us with a very nice 72 degree high temperature. Thursday night we will have mostly clear skies and a low temp of 48 degrees. Friday will be mostly sunny and still very pleasant at 73 degrees. Friday night will drop to about 56 degrees with a few clouds hanging around. Saturday starts off dry with mostly sunny skies and a high temperature of 79 degrees. Rain chances return Saturday night at 20% chance of thunderstorms with an overnight low of 63 degrees. Since most of you are interested in the weather for this coming Memorial Day, I hate to say that it is likely to be wet. Officially there is a 40% chance of rain and storms for Monday with a high temperature of 84 degrees. 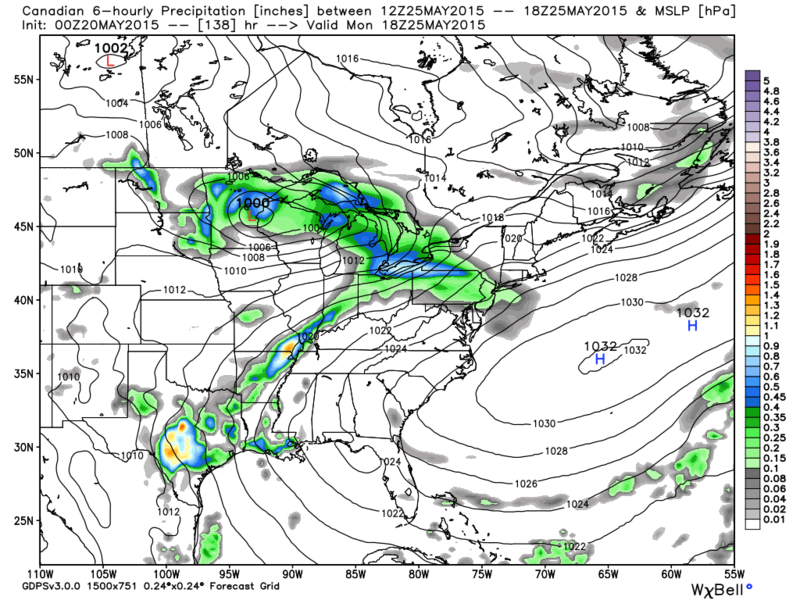 The good news is that both long term models (GFS and Canadian) are not showing too much rain for Monday. It’s best to have an indoor plan for any activities just in case, but we will see how this forecast shapes up in the coming days.